Penn Manor High School seniors got a boost to their post-high school plans when members of the Class of 2017 received 170 scholarships and awards totaling $118,375 during the Senior Awards Ceremony on May 18. The honors included 44 scholarships and awards administered by Penn Manor Education Foundation totaling more than $50,000. Many thanks to the individuals, organizations and businesses that contributed to all the awards. The seniors also earned outside scholarships and aid totaling more than $3 million to continue their education after graduation. 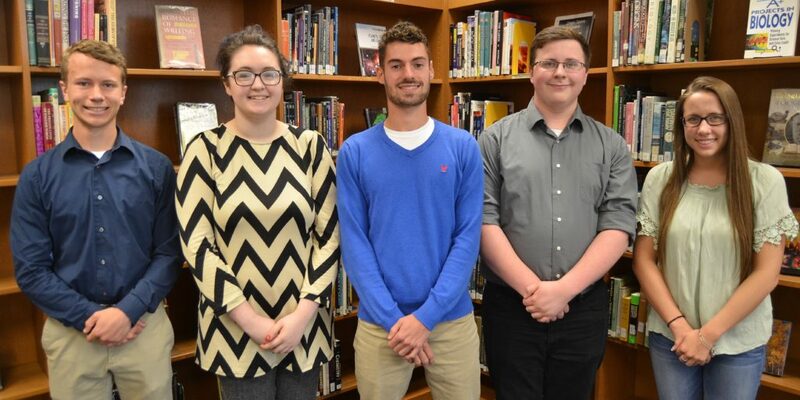 The top recipients of Penn Manor academic scholarships/awards were Malachi Lyon and James Mintzer, with seven awards each; Madison Beatty, with six awards; and Alyssa Ames and Doug Kramer with five awards each. Congrats to all the seniors who earned awards, and best wishes on your future endeavors! The top scholarship/award winners among the Penn Manor Class of 2017 were, from left, Malachi Lyon, Maddie Beatty, Doug Kramer, James Mintzer and Alyssa Ames.